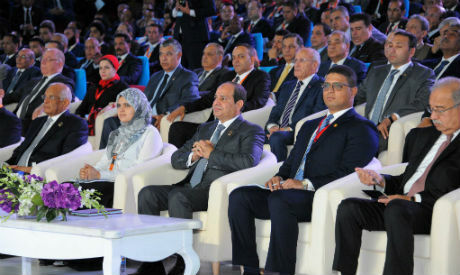 Terrorism and population growth are two of the biggest threats facing Egypt in its history, the country's President Abdel-Fattah El-Sisi said at the Fourth National Youth Conference in the coastal city of Alexandria on Monday. During the conference, El-Sisi said that the current rate of population growth in Egypt poses a threat to the nation, restricting Egypt's progress. The number of Egyptians worldwide according to the government's statistics authority now stands at 101 million, including 8 million living abroad, with officials maintaining that steep rise in population will hinder the country's development plans. The country's population stood at 99 million in June 2016. In March of this year, The Central Agency for Public Mobilisation and Statistics (CAPMAS) said the annual rate of population growth in the country is 2.4 percent. The president's comments followed a presentation by Health Minister Ahmed Emad El-Din Rady as part of the conference's agenda concerning the "Egypt Vision 2030" development plan. Egypt Vision 2030 aims to implement a programme of sustainable development policies involving the country's youth, to be implemented regardless of any changes in government or leadership. "You would lose your children because you can't afford to spend money on them," El-Sisi said. "You want to ensure education is provided to all? Fix the population problem. You want to guarantee job opportunities? Fix the population problem. You want medical services? Fix the population problem," El-Sisi said. He said that the population dilemma was a threat to both Egyptians and the government, with each having a role to perform, although the benefits of the appropriate actions would not be immediately visible. During a presentation on education reforms by Education Minister Tarik Shawki, one attendee asked about the salaries of teachers, with El-Sisi commenting: "We either have patience and fight to reach development, or we beg." Shawki said the ministry's main goal was to provide education and training to all without discrimination, as well as to improve education and the competitiveness of the education system. He also assured high-school students and their parents that there would be no additional reforms now to the secondary certificate system, known as Thanaweya Amma, which has been harshly critcised for years. He said a new system might be adopted at some future point, but he did not say when such a move might happen. "The new Thanaweya Amma system should be tested before its implementation," El-Sisi said. Monday's conference is the most recent in a series of events in Sharm El-Sheikh, Aswan and Ismailia aimed at tackling issues of direct relevance to Egypt's young people, including enhancing their political participation and preparing them for future leadership roles.